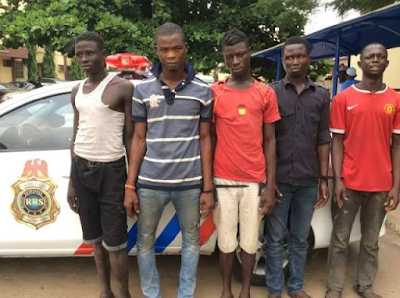 The onslaught on in-traffic robbers by the operatives of Rapid Response Squad (RRS) of the Lagos State Police Command is yielding results with the arrest of five robbery suspects in different parts of the metropolis. The suspects were apprehended during a special raid by the RRS operatives on robbers who were attacking and dispossessing members of the public of their valuables in traffic. 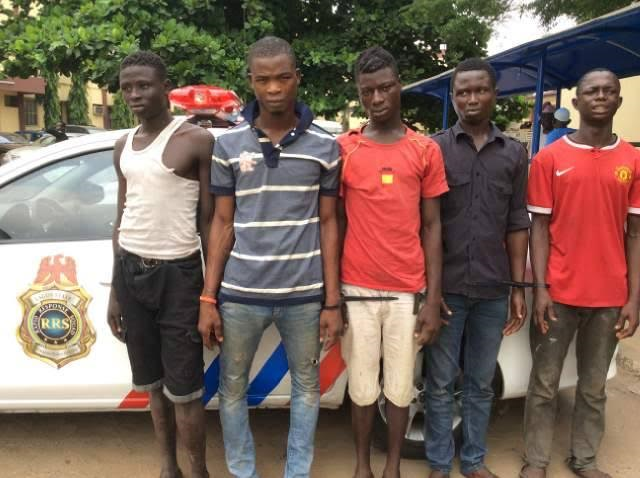 The suspects, Oyeleke Abdullah (24), Olajide Dipo (17), Saheed Alayande (17), Azeez Yusuph (21) and Oyeniwa Wasiu (18) were nabbed in Victoria Island, Ojodu Berger, Oshodi, Obalende and Ilubirin around the state. RRS investigator revealed that before the arrest, the State Commissioner of Police, Mr. Fatai Owoseni, had directed the RRS Commander to deploy more operatives to Ojodu Berger, Lekki and Oshodi in order to ensure ‘Ember’ month free crime. It was gathered that some operatives of the RRS’s Decoy Team, in arresting one of the suspects, Azeez Yusuph, pretended to have had a broken down car under the Ilubirin Bridge around 4:23 a.m.
“It was very early in the morning when an undercover policeman pretended as if his vehicle broke down on the bridge while some of his colleagues hid somewhere to ambush the robbers who would come and harass the lone occupant of the vehicle…. The suspect showed up few minutes trying to collect handset and money from him, that was when we arrested him,” the source said. He hinted that the operatives also got complaints from members of the public on RRS social media platforms about the activities of miscreants on road users with broken down vehicle in Ilubirin. Abdullahi confessed to interrogators “I was trying to make ends meet by snatching valuables of stranded drivers on the bridge,” adding that he sleeps underneath the bridge along with his colleagues. Confirming the development, the Police Public Relations Officer, Superintendent Dolapo Badmos, said that the Command was on high alert to curb social miscreants who exploit traffic situations in the metropolis to dispossess Lagosians of their valuables on the road. The suspects have been transferred to State Criminal Investigation Department (SCID), Yaba, for further investigation.